Beautiful white stretches of sandy beaches, old traditional fishing villages and family friendly holiday resorts make the Balearic island of Mallorca a popular European holiday destination. 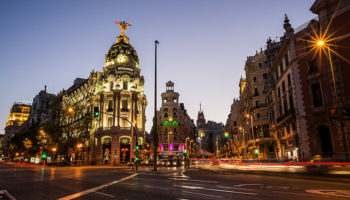 The classic picture of a Spanish holiday, visitors can take their pick from one of the many fantastic resort towns with accommodation to suit everyone from holidaymakers to young ravers. 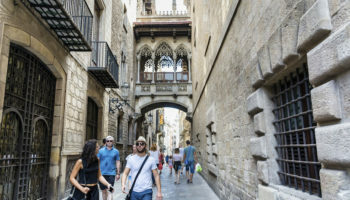 The capital city of Mallorca, Palma de Mallorca is a stylish and sophisticated town with elegant boulevards, chic shopping and pavement cafes all nestled along the bay of Palma. It’s the island’s cosmopolitan centre and is home to numerous bars and restaurants serving traditional island cuisine. 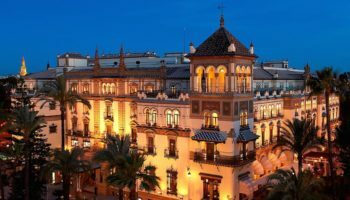 Palma’s nightlife isn’t as lively as other areas of the island and is a great place to stay if you are visiting the island on a weekend break as there is a wide selection of luxury hotels to choose from. There are some interesting historical attractions in the capital, including the 13th century Santa María cathedral, but you can explore the rest of the island by the bus network. Gran Melia Victoria – With its Mediterranean steakhouse, dedicated breakfast restaurant, swimming pools (indoor and outdoor), and cocktail bar – amongst other things – this 5-star hotel is packed full of lavish options for food, drink, and relaxation. You can keep up with your workouts at the fitness center or get a spa treatment before heading out to explore what the town has to offer. The rooms at Gran Melia Victoria are refined and spacious, but one of the best things about this place are its views: you will either be overlooking the picturesque Bay of Palma or the historic Palma Cathedral. 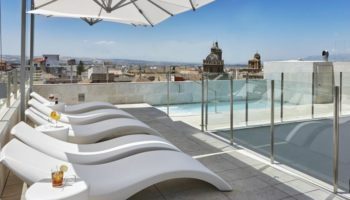 Hotel Saratoga – Just under fifteen minutes on foot to the historic Palma Cathedral, Hotel Saratoga is a well-positioned hotel in Mallorca’s main town. The rooms here are modern and sleek, boasting flat-screen TVs and balconies; families can opt for suites which add more room for everyone to spread out. There’s a bar here which regularly puts on live jazz shows – great if you’re a music fan or like your evening drinks served with a little bit of atmosphere. When you want to chill out, head to the rooftop pool to catch some rays and have a refreshing dip. Hotel Almudaina – With its great location, this top hotel puts guests within easy walking distance of the Port of Palma. Not only that, there’s plenty to explore in the local neighborhood, from bars and restaurants to great shopping opportunities. The rooms are modern, spacious, and come packed with all the modern facilities you’ll need. One of the best things about this place, however, is its charming rooftop terrace, complete with pleasant views over the town and port. If you’re arriving from the airport, the airport bus stops right outside this hotel. A tiny port town on the north of this island, this old fishing village is now home to a family friendly resort with long stretches of sandy beaches and calm sandy waters. The port hasn’t lost its sleepy charm – the night life here is low key with many waterfront restaurants catering to couples and families. Since the iconic Hotel Miramar was first built in Pollença in 1912 the town has developed to have many charming accommodation choices. Take a stroll along the town’s famous Pine Walk where the elite of Majorca once built stylish retreats, enjoy the stunning views of the Pollença Bay and enjoy an afternoon taking part in one of the many activities in the area which are tailored towards tourists, such as golf or kite surfing. Hoposa Uyal – Hoposo Uyal is set right on the seafront, which automatically means amazing sea views. Dating back to 1954, this place is all about traditional Mallorcan architecture mixed with stylish, modern features for extra comfort. The rooms are clean and contemporary and even boast balconies overlooking the sea. This hotel is a hop, skip and jump away from Pollensa Beach, meaning that if you like beachside living, this is a great choice. There’s a large outdoor pool to splash around in, plus a spacious sun terrace for catching some rays. Hotel Eolo – This 3-star offering has direct access to the beach, so beach bums take note. This place is decked out with traditional, laid-back design and features an equally laid-back atmosphere for a relaxing holiday. This decor style extends to the rooms, which boast sea views and a terrace. The Eolo Hotel features a cafe and restaurant, where you can enjoy delicious Italian food on the sun-drenched terrace. If you’re interested in getting out on a boat, this hotel is set in the heart of town, next to the Porto Pollensa Sailing Club. The attraction of Cala d’Or’s several sandy cove beaches means that the area has developed in recent years from a once tiny fishing village to a full fledged tourist resort. The town’s streets are now lined with bars, cafes and restaurants which cater to the foreign tourists and there is a huge variety of hotels with family friendly amenities to choose from. Regardless of the steady flow of tourism, Cala d’Or remains charming with narrow cobbled lanes and low white-washed buildings. The town is connected by a bus service which can be unreliable but with a direct bus route to the airport, it’s a great choice for your stay on the island. Inturotel Sa Marina – This is a large, elegant resort that features all the amenities you could desire. The rooms come in a selection of sizes to suit every sort of visitor – especially families. Each room comes with a kitchenette, a lounge area, and even a furnished balcony. The large outdoor swimming pool is set under the shade of palm trees, which is great to let your little ones splash around in; there’s also a children’s play area and a kid’s club when you want some time to yourselves. In the evening, the hotel puts on entertainment. The large family resort of Port d’Alcudia attracts thousands of international tourists a year with its swathes of soft white sloping sand beaches along the Bay of Alcudia. 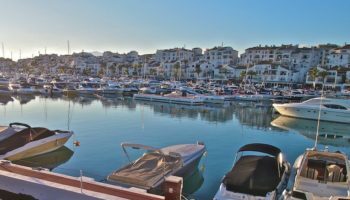 Around the town’s picturesque marina, boutiques and restaurants make for a relaxing atmosphere whilst the traditional Mallorcan old town of Alcudia, neighbouring Port d’Alcudia, is an interesting day trip for its architecture and history. The main pedestrianized boulevard in town, Ciudad Blanca, is the center for the port’s tourist attractions and activities and is where a range of hotels can be found, offering a selection of often well priced accommodation for groups and families. Hotel Ivory Playa Sports – Hotel Ivory Playa Sports is just fifty meters from the beach in Alcudia Bay, which means you won’t be far at all from your very own relaxing slice of sun, sea, and sand. Designed with comfort in mind, this 3-star hotel comes equipped with rooms that boast kitchens and convenient dining areas, making for a great family getaway – you can cook some of your own meals to keep costs down. Everything here is kept very clean and it’s all well maintained. Views from this hotel are of lakes and mountains – beautiful. Lively Magaluf has become synonymous with Mallorca’s notorious party scene; this is the town to stay in if you are on the island for an all-night party. Groups of young people on holiday travel to Magaluf to spend their days lounging on the sandy beaches and their evenings enjoying themselves in the many late night bars and clubs. The resort has grown upwards, with numerous high rise hotels and holiday apartments making accommodation reasonably priced. 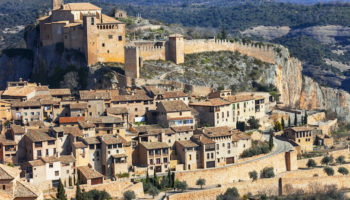 There is plenty to do in the area to keep you entertained, but good public transport links and a regular bus to Palma city mean you can explore the rest of the island too. Meliá Calviá Beach – This hotel is a stylish offering with contemporary decor, all set right on the seafront at the eponymous Meliá Calviá Beach. This is perfect for days spent lounging around on the beach, but this hotel also comes complete with three outdoor pools and one indoor heated pool, so you’ll be spoilt for choice when it comes to splashing around. Rooms boast sea or garden views and feature spacious terraces for siesta time. Grab a drink in the pool bar, lounge bar, or take your pick of one of the hotel’s two restaurants. Beautiful old Alcudia remains a slice of the real Mallorca. 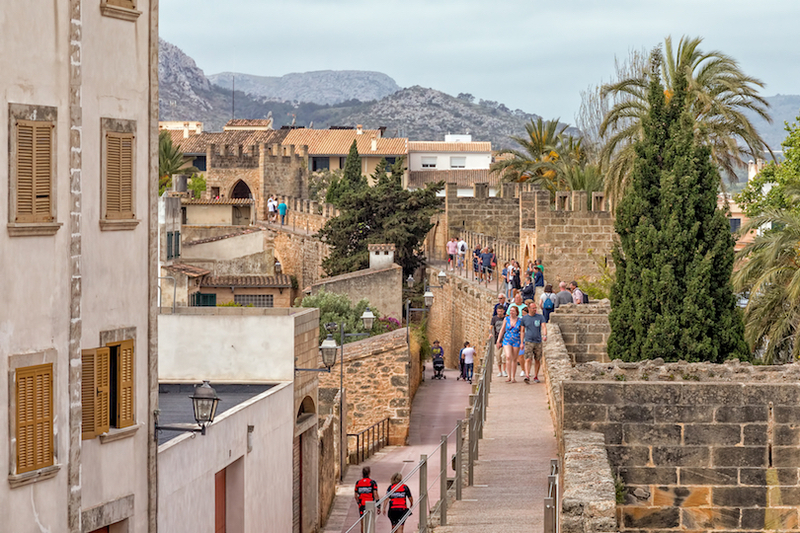 Winding cobbled streets and an ancient old town that dates back as far as 14th century shows visitors to the island a slice of what Mallorca used to be. The simple traditional houses and buildings are surrounded by old medieval walls that were built to protect the town from invaders. Today the town is very attractive to tourists who are looking to understand more about the history and culture of Mallorca. Hotels in Alcudia are smaller and more traditional, and staying here would mean a slower and quieter pace of life compared to the big resort towns, but it is easy to hire a car in order to explore the rest of the island. Cas Ferrer Nou Hotelet – This is one of those smaller, local-feeling places to stay; a rustic place which still features contemporary interiors. Each of the rooms is individually themed and there’s lots of attention to detail for a design-led aesthetic. It’s full of historic charm and fashionable features; in fact, it’s housed in an old blacksmith’s shop in the center of Alcudia’s Old Town. There may only be six rooms here, but that just heightens the sense of exclusivity as well as homely charm that this place oozes the moment you walk through the door. Close to the airport, this newly built town has all of the amenities you should need to make your stay on Mallorca enjoyable. The town has a friendly feeling and draws many families to enjoy the beaches year after year. Palma Nova’s center is packed full of international eateries, bars and late night entertainment. The beaches around the town are all clean, white sand bays which offer visitors the chance to try out a whole range of different water sports. 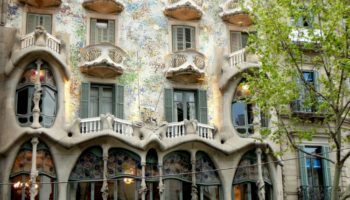 If you you are thinking of staying in Palma Nova, you will find accommodation to suit your price range; everything is on offer here from small budget apartments to luxury villas. And with great bus links to Palma you can also take in some of the sites on the rest of Mallorca, too. Aparthotel Ponent Mar – Featuring a spa and multiple luxury, outdoor swimming pools, this high-end hotel is the perfect place to come to relax in the sun. It’s a sprawling, village-like complex boasting sweeping, manicured gardens and sun terraces. You won’t ever want to leave. Set on its own peninsula, there’s a huge selection of apartments to choose from, making it just as perfect for a couple’s getaway as it is for a family break. If you feel like you need to get away from this huge resort, don’t worry, it’s easy to rent a car to explore the local area. Surrounded by mountains, the traditional old port town of Port de Sóller has a quaint, charming atmosphere with its sweeping golden beaches. The town attracts couples and tourists looking to enjoy Mallorca’s nature as the surrounding area features some popular hiking and cycling routes. New trendy hotels have started to pop up in the port and the area is home to some great restaurants and cafes. 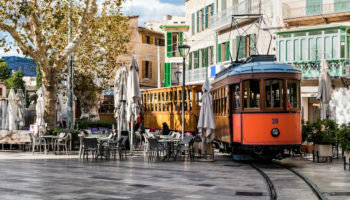 Bus links make it easy to connect to other towns, as well as the train service that runs to Palma – as well as the iconic tram service, named the Orange Express as it passes through orange groves. Hotel Miramar – This is a family-run hotel set in a location that’s simply perfect for hiking in the nearby Tramontana Mountains; if you like to get outdoors, this is a good place for you. It’s also close to the Sun Termens Golf Course if you fancy a few games. The rooms are decorated in a beachy Mediterranean theme, and many of them overlook the Port de Soller Beach, which is just a stone’s throw from this 3-star offering. When you’re done exploring for the day, have a few drinks at the picturesque terrace bar. 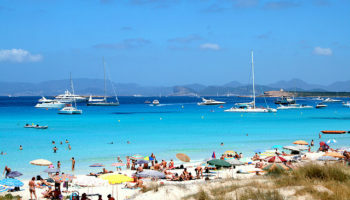 Cala Millor is all about the beaches, the sea is calm, the sand is white and the beach is wide. A palm-lined promenade runs along the seafront and is where you will find plenty of shops selling everything visitors might need to make their holiday easy. This is a family friendly resort town with fun parks and activities for children to enjoy, but as night falls the town does hot up with holidaymakers enjoying the town’s nightlife. Cala Millor has a huge choice of budget, self-catering holiday apartments and villas to stay in. Most people stay around Cala Millor to spend their days on the beach, but there are bus connections, and neighboring resorts are easily reached on foot. Marins Playa – Boasting a fitness center and two pools (one indoor, one outdoor), amongst other things, Marins Playa also features an adults-only, sun-drenched roof terrace with hot tubs and sun loungers. There’s also a bar with a good selection of drinks, a small onsite supermarket, and even entertainment in the evening for adults and children alike. Thanks to its huge selection of apartments and suites, there’s something for everyone. If you’re feeling active and want to explore the local area, there are top range mountain bikes that you can rent from this hotel. An important fishing port on the island, Cala Ratjada is a popular family holiday destination with a gorgeous sandy beach and a natural pine forest along the rugged coast. A walk along the seafront promenade will take you along the coast to small bays past tiny fishing cottages. Cala Ratjada itself has retained its traditional charm with fishing boats still operating in the harbor. The town is popular with European holiday makers and as such there are many international restaurants alongside family-run restaurants serving traditional local cuisine. Night time in town can be a lot of fun with a younger crowd enjoying the bars and clubs. The popularity means the beach can be busy in the day, but a range of hotels offer pools and a place to relax. Hotel Triton Beach – This hotel boasts calm, modern rooms for a chilled out place to spend your Mallorca holiday. There’s an outdoor swimming pool decked out with sun loungers for catching some rays, as well as a restaurant where you can refuel after another hard day of relaxing! It’s not luxury, but it’s low-key and quiet enough that it’s good for a young couple’s holiday. Being five minutes from Cala de S’Aguila Beach means you’ll be able to spend days lazing around on the shore with no problems at all. The breakfast buffet every morning is delicious, too. Developed from an old fishing village, laid back Can Picafort’s long 3km stretch of white sandy beach is a big attraction for tourists. Along the seafront a wide promenade is dotted with bars and cafes where people sip on cocktails and enjoy the ocean view. Restaurants in the town are varied and reasonably priced, offering food to suit the international tourists. Boat trips to other resort towns are a big attraction here, as well as a regular weekly market selling a wide array of items and souvenirs. Hotels in Can Picafort cater to families on holiday but further out, more rural and luxury accommodation can be found. Grupotel Gran Vista – The upmarket Gran Vista is the place to stay if you want to feel like you’re staying in one luxury village. There are multiple places to eat here – including two bistros and a large, buffet-style restaurant – as well as two bars and a large outdoor pool; all of it set in lush, sprawling gardens. This is a great option for anybody arriving (or departing) via bus, or who wants to get around the island to explore: it’s just a three-minute stroll to the Ctra. Alcúdia-Artà bus station. Peguera’s three excellent beaches – Playa Palmira, Playa Tora, and Playa La Romana – attract plenty of European tourists to return year on year. The town, like many on the island, has grown from being a fishing village to become a holiday destination and has all of the hotels and facilities that go along with it. The resort is beautifully manicured and is easy to walk around on foot. 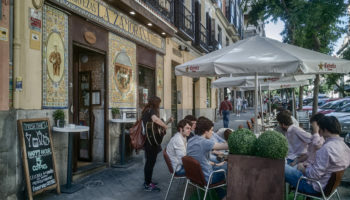 Strolling along Peguera’s streets you will find all sorts of delicious eateries and pretty cafes inviting passersby to have a relaxing break in the sunshine. Much of the town is set on steep slopes, which combined with hundreds of hotels make it a perfect base for those looking to do some hiking whilst staying on the island. 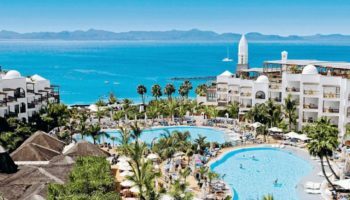 Universal Hotel Lido Park – For those who like to be virtually on the beach, the Universal Hotel Lido Park is a great option; this resort hotel has direct beach access, which makes enjoying a spot of sun, sea, and sand very easy. It’s a good choice for families too, with a kid’s club so parents can enjoy some peace and quiet for a couple of days. There are outdoor and indoor pools here to splash around in, plus a free breakfast served every day in the airy terrace restaurant. beautiful places that I would love to visit.